The question makes me laugh. It’s like asking a cook what their favorite kitchen appliance is. Or asking a man to choose just one tool out of his entire toolbox. 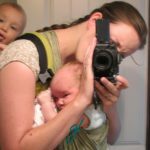 But since you asked, here are the favorites from my babywearing stash. 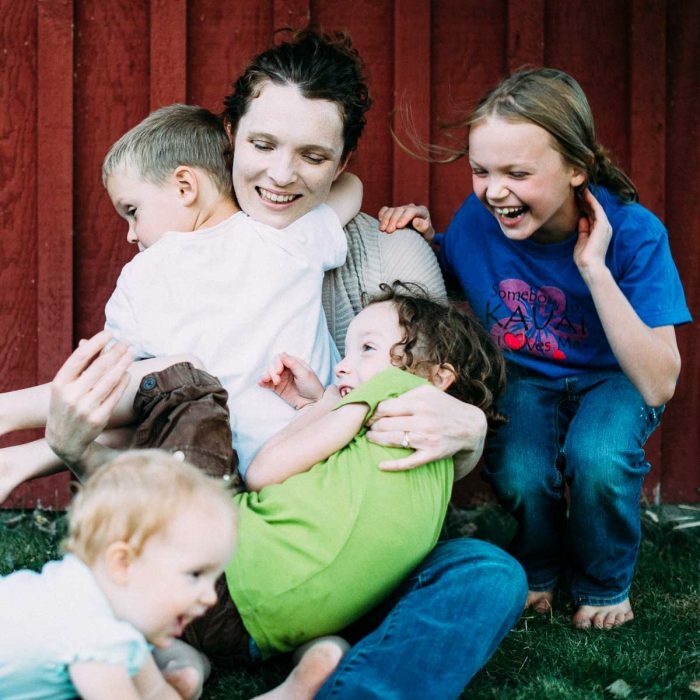 If I had to start out with only one baby carrier, I’d put a Solly Baby Wrap (or two!) on my baby registry. 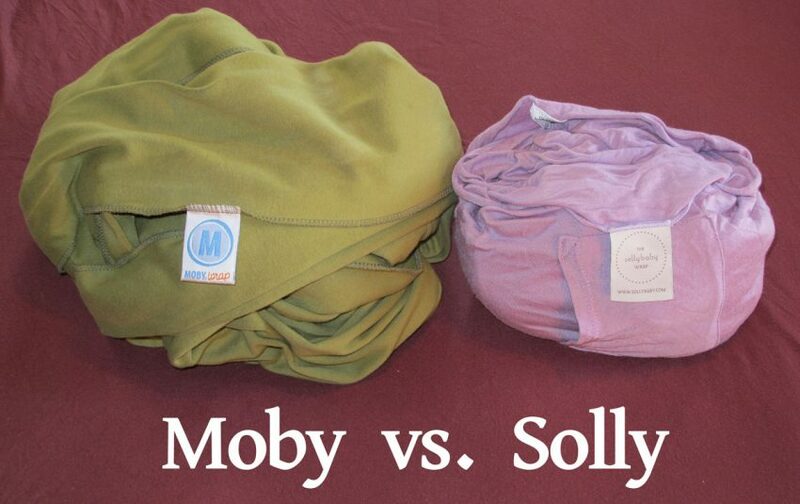 At first glance, a Solly may look like a Moby or a Boba wrap. But it’s a whole new class of stretchy wrap. The Solly Baby Wrap is made of certified Lenzing Modal, and simply as soft as can be. Perfect for holding a newborn close. And lasts up to 25 pounds. The Solly folds into its own pocket for easy storage (plus it has a mini pocket for holding keys or a pacifier when you’re wearing Baby!). And the Solly fits in a fraction of the space of a Moby, meaning there’s plenty of room in your diaper bag for a ring sling or SCC, too. Learning Curve: Solly Baby has some fabulous video tutorials that make wrapping your baby look easy. And with a little practice, it is! 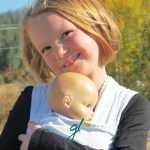 The great thing about the Solly Baby Wrap is that you wrap and tie it in place before you ever put your baby in it, so you can easily practice before baby–and with a stuffed animal. My daughters (ages 5 and 7) learned to tie their dolly wraps by watching the Solly tutorials a few times. It’s that simple! Please Note: A stretchy wrap is not designed for back carries. And while the Solly Wrap is safe for use up to 25 pounds, you may find that by the time your baby reaches that size, you need a more supportive fabric like that you’d find in a woven wrap. 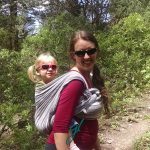 If I were going to choose a baby carrier that would work the longest, I’d choose a woven wrap. Not only does a woven wrap last from birth to toddlerhood, but it’s one of the most comfortable options for longer wearing sessions because of how evenly a wrap distributes the weight across your shoulders. Learning Curve: While a stretchy wrap is tied before you place the baby in the wrap, you actually wrap a woven wrap around the baby for the most part. This means there’s more of a learning curve to become adept at wrapping your baby safely and securely–especially with newborns. But it’s worth the time it takes to learn! If I had to choose the fastest baby carrier to use, it would be the ring sling (RS). Pop it over your head, put the baby into a deep seat, tighten the rails, and go. When I’m going to be out and about for awhile, and know I’ll have the baby in and out of the car and be breastfeeding, I’m always sure to have a ring sling along. While I don’t usually nurse in the sling, it makes a great nursing cover. And it isn’t so long that I have to worry about it dragging on the ground when I’m transferring baby in or out. 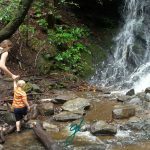 Learning Curve: The learning curve of a ring sling may be a bit of a challenge for someone who’s not used to babywearing. Learning how to tighten the rails correctly and evenly requires education from a few YouTube videos. 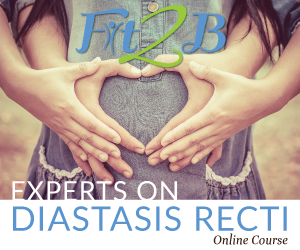 If you’re slinging a newborn, learn how to twist and tuck the remaining rail to provide a cushion for the baby’s head. Please Note: A ring sling is less secure that a wrap or SCC, because the baby is positioned in a deep seat, without anything going between their legs. When the rails are tightened correctly, a ring sling is a very safe babywearing option. However, if your little one is a “seat popper” who likes to arch their back, a ring sling won’t be ideal. And even though a good ring sling distributes the weight well, it still puts more pressure on one shoulder. If you’re prone to back/shoulder/neck issues, go for a wrap! Learning Curve: The SSC has the easiest learning curve, with familiar buckles and straps that make it easy to figure out what goes where. Please Note: The buckles and straps that make the SSC easy to use also make it the least customizable in wearing style. Most SSCs advertise that they work from birth up, but some require an extra infant insert or convert to infant positioning. But no SSC will hold your newborn as snugly as a wrap. SSCs are ideal for once your baby has some head control and is big enough not to fall out. Most standard (i.e. not specifically designed for toddlers) SSCs can really only be used up through 18 months or so. 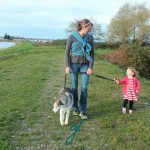 Check the Babywearing Safety Considerations to make sure you’re getting a truly ergonomic carrier that will keep your baby’s bum and knees in an “M” position and supports from knee to knee. Yes, I love the quick on and off of ring slings. But I prefer wraps for longer wearing because of the way they distribute the weight so comfortably. The Solly Baby Wrap takes the prize for the best baby shower gift ever. But as my baby girl gets older, I’m sure I’ll be turning to the soft structured carrier and woven wrap more often. Just like I did with her big brother and sister. 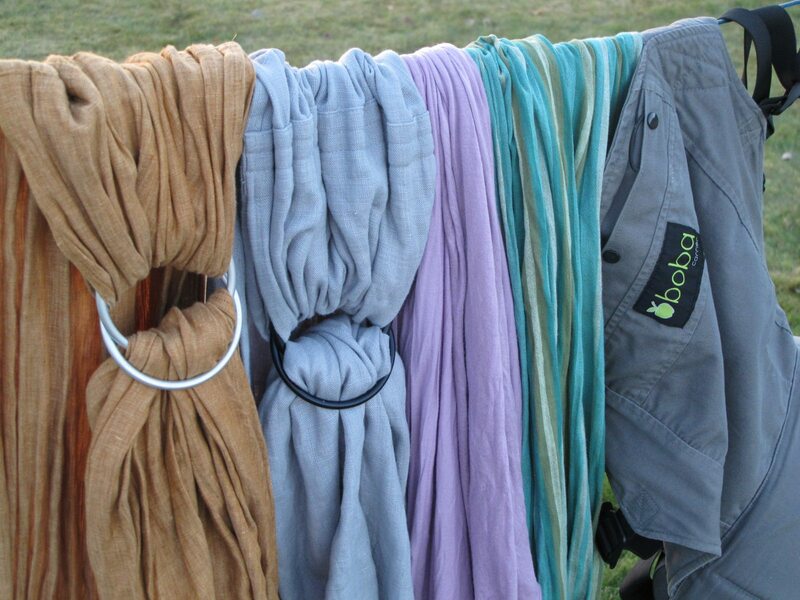 Could you narrow your babywearing stash to just one? What carrier would you choose? P.S. If you’re here because you’re making a baby registry, be sure to put a set of the Solly Swaddles on your wishlist, too. 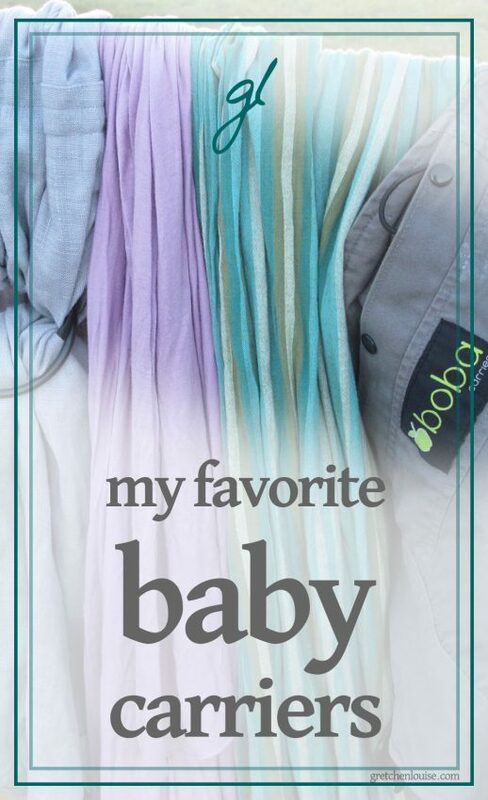 Made of the same super soft fabric as the Solly Baby Wrap, I’m fairly sure they are still going to be snuggle favorites when we’re long past the swaddling–or even babywearing–stage. I love my Wildbird! It’s the grey/blue sling in some of the photos in this post, but is featured more fully in photos here. I have not tried a Maya. I have a didymos, sakura bloom ringsling, amazonas ringsling and a tricot slen ( i think these are comparable to moby). The Sakura Bloom ringsling is my favorite of the ringslings, and yes, I use it for fast moments. The woven Didymos is for back carries. The Tricot Slen I used when they were babies, and now for front carries sometimes but not as much. I would really love a Solly Wrap, but that one will have to wait until the next baby, if we ever have another one.